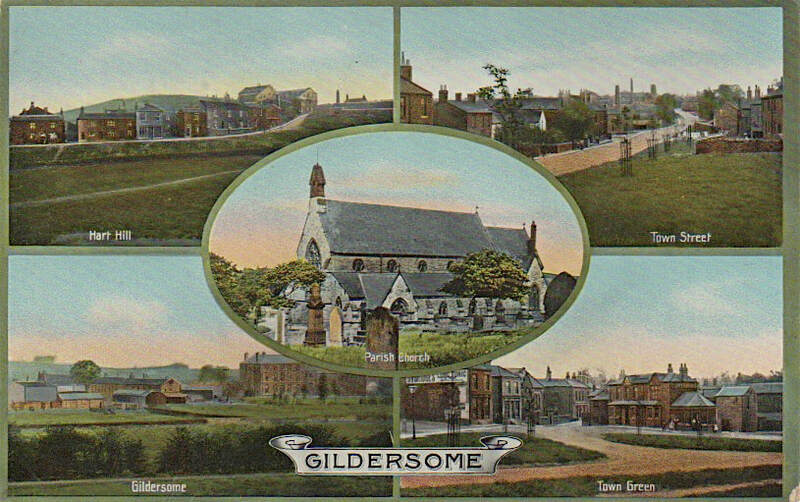 ** NOTE** Use the thumbnails below to navigate through the different areas of Gildersome. The Green & Finkle Ln. 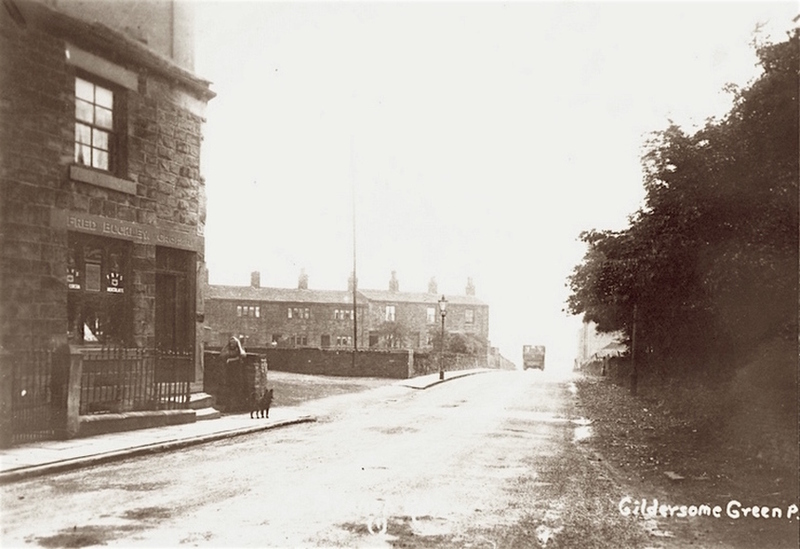 The Dean Wood footbridge depicted in the illustration above, is clearly marked on the 1800 Enclosure Map of Gildersome as being slightly north of the present day bridge on Asquith Avenue. Earlier maps also provide proof that a well used road connected Morley with Gildersome along the same route. 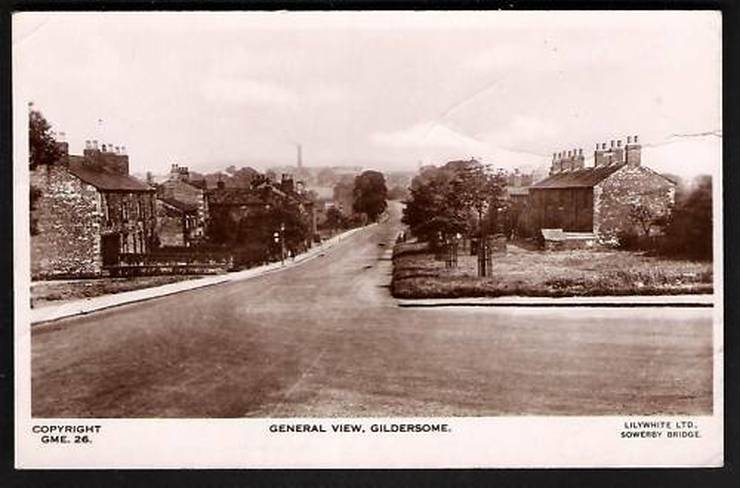 After the construction of the Leeds to Birstal Turnpike (Gelderd Road) in about 1826, serious travel along the old road faded away. It took nearly 70 years and the building of the "New Bridge" to once again reconnect the two towns. Gelderd Rd. and Branch End. 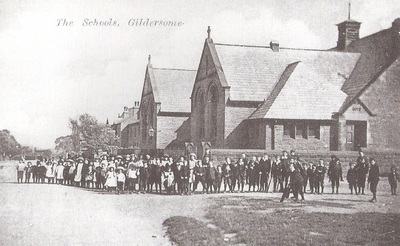 This shot was lifted from a "Scenes of Gildersome" postcard. Gelderd Rd. runs off to the left and Branch to the right. 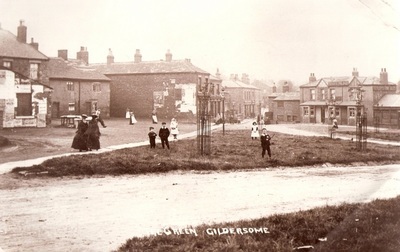 The row of houses to the right was called Ebenezer Row. Behind the photographer is Asquith Ave. and the bridge to Morley. Left, the same spot today. Maggot Row. 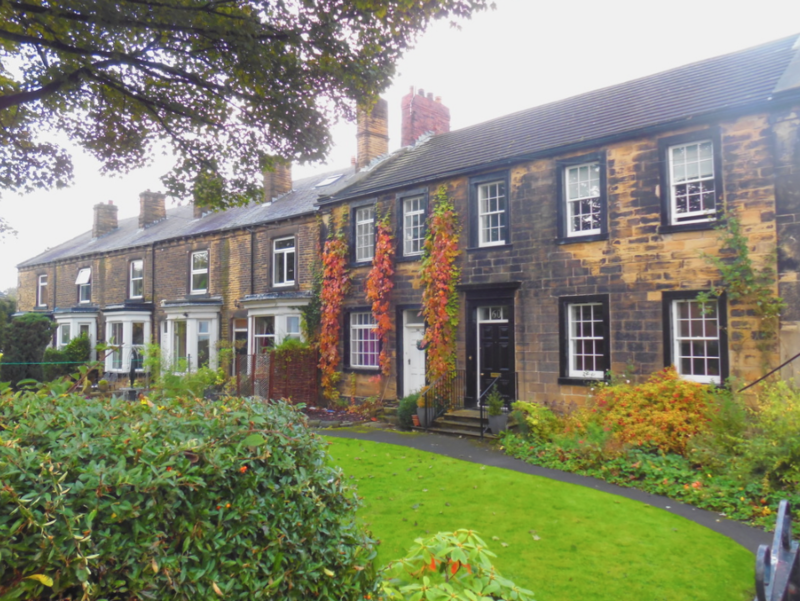 Worker's Cottages. 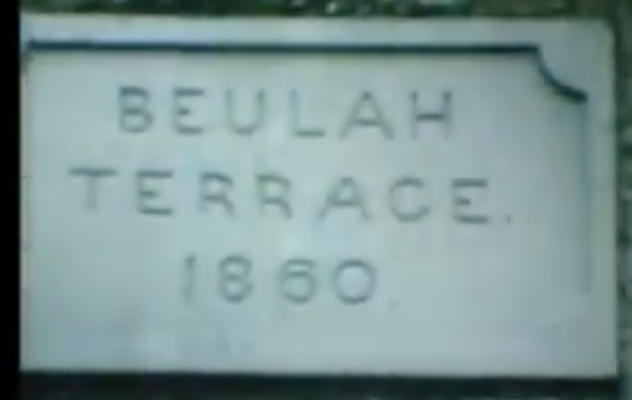 Can be found on an 1850s Map. Branch Rd at Highfield Rd. A young girl and her dog stand in front of Fred Buckley's Grocery. Across the road is the Yarra House (not visible, off the photo to the right behind the trees). Down the street to the left is Maggot Row and across from that, one can just make out the end of the Ebenezer Cottages. After her tour around the world, Queen Elizabeth visited Yorkshire in 1956. 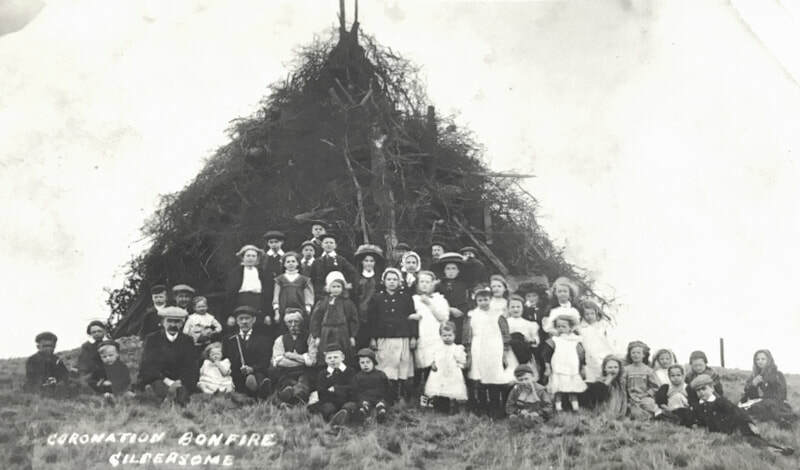 This photo, taken at the top of Branch Road, shows some of the crowd hoping to catch a glimpse as she motored through Gildersome. Behind the shop and workmen's cottages is Highfield Mills. 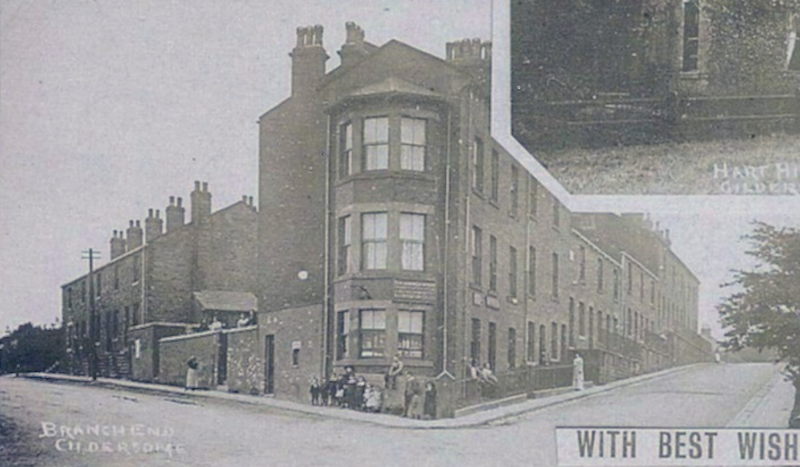 The same shop and workmen's cottages seen in the photo above. 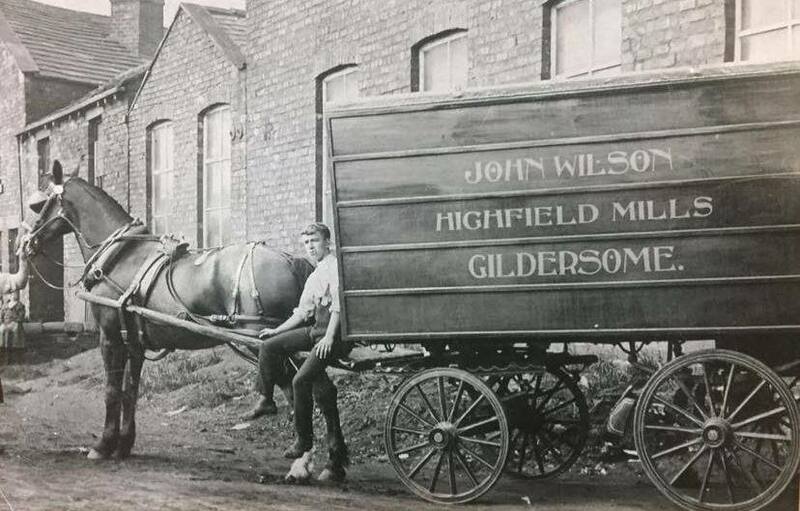 The Wilson Brothers were the owners of Highfield Mills. 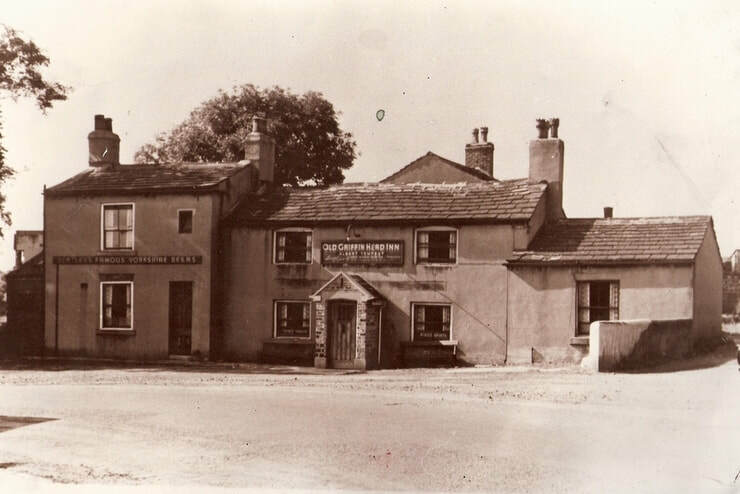 The Griffin Head Inn at the top of Branch Rd. The two women in the foreground, left, are standing in front of Highfield Row and a shopkeeper stands by the door of his shop at the north end. 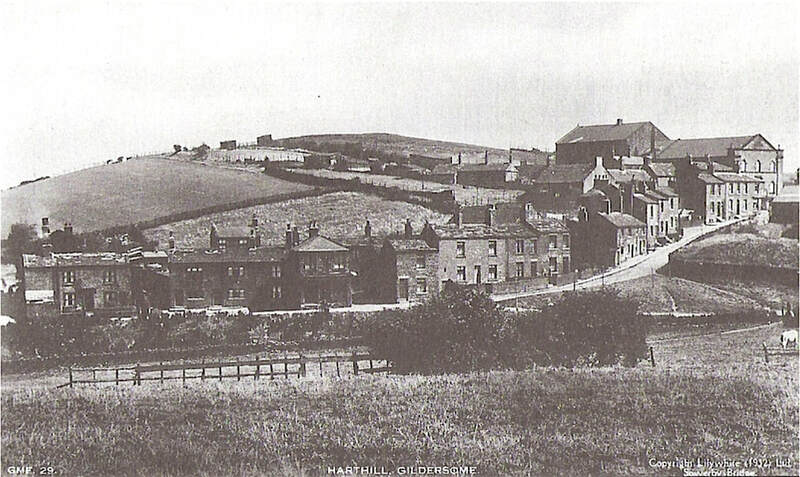 Behind the stone wall on the right is the grounds of Highfield Mill. 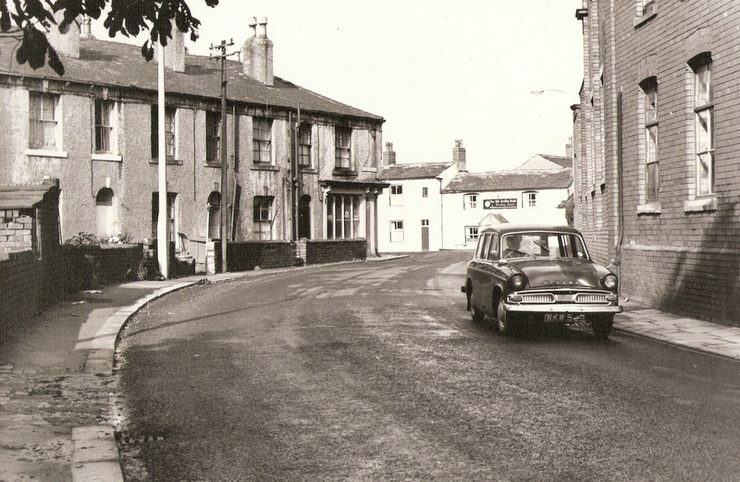 Branch Rd at the Griffin. The photographer has his back to the Griffin and is shooting toward the top of Branch Ave. and the location where he stood when he shot the previous photo. 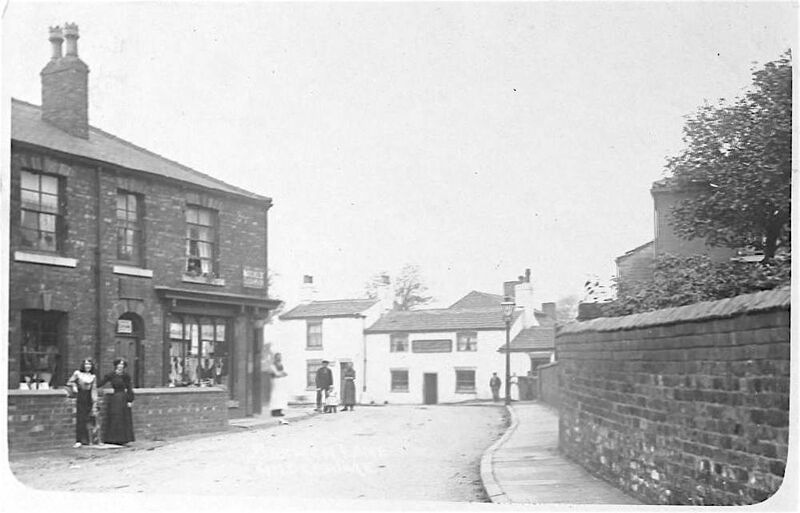 The same lamppost, to the left of the gentleman in the foreground, can be seen in both photos as well as the opposite corner of the same shop at the end of Highfield Row. 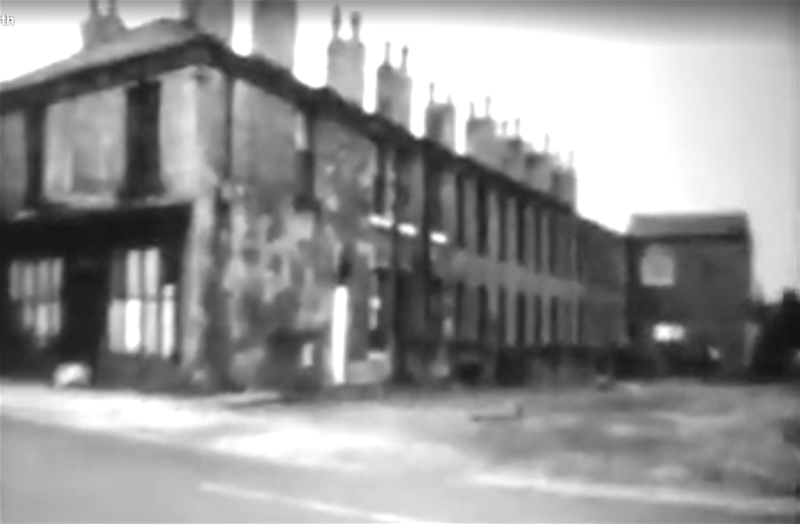 The roof to the left of the lamp belongs to Highfield Mills and the houses on the extreme left were workmen's cottages and a shop. 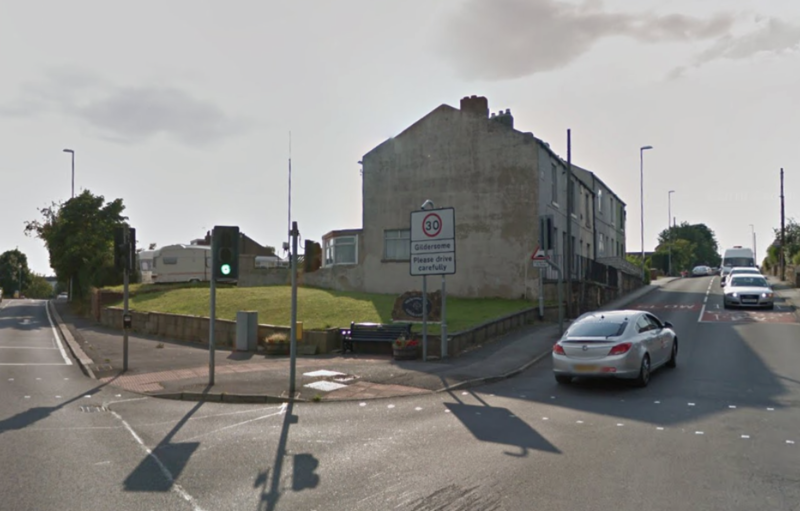 To the extreme right, and not seen in this shot, is the intersection with Beulah Terrace. Looking at Highfield Farm between the buildings. 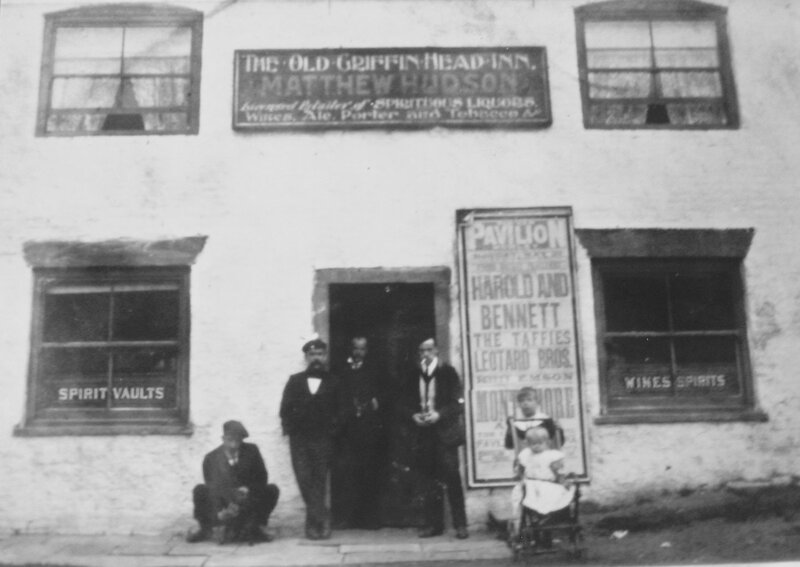 Four views of the Old Griffin Head, early 1900s. All courtesy of the Morley Archives. Looking west from the Griffin. Webster Row is on the right and behind that is the Old Hall. The property behind the fence on the right belongs to Harthill House. 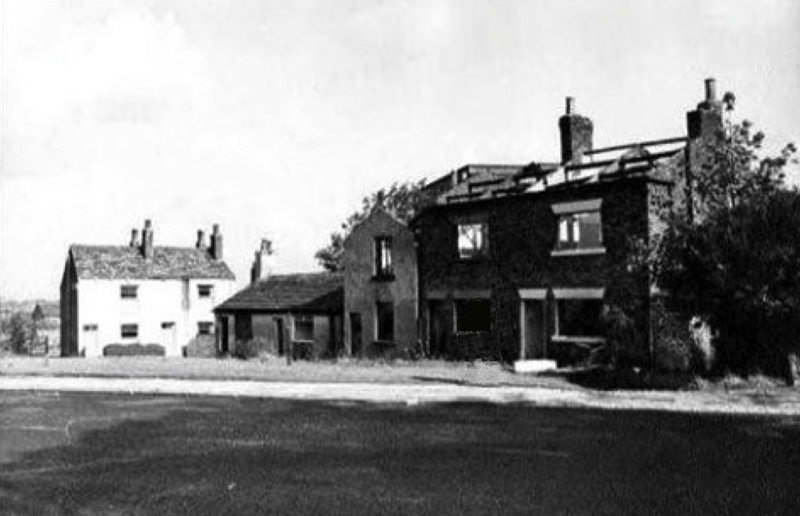 Webster Row, behind stood the Old Hall and the Old Hall Mill. 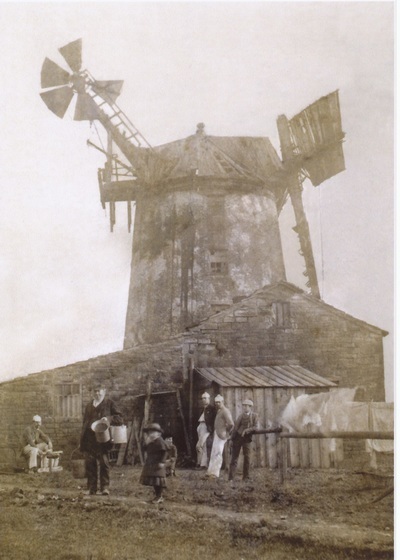 As its name implies, it was probably constructed in the 1860s or 70s by Joseph Webster to be used as worker's cottages for his mill. Seen at its end, to the right, is a shop which can bee seen in the next photo. A view of Webster Row seen from its opposite end. 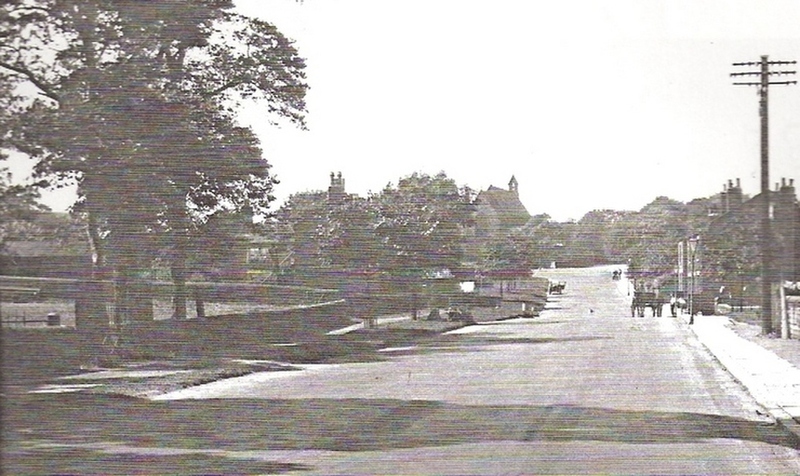 Branch Road at College Rd. 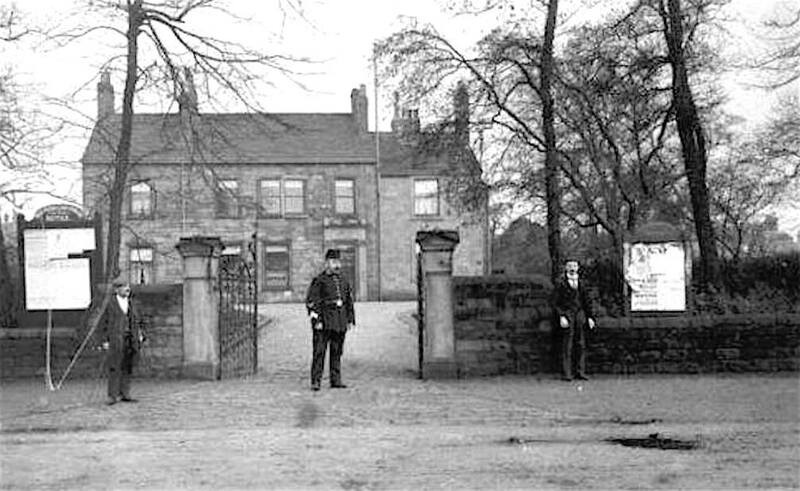 Turton Hall is to the right and slightly behind the Photographer. 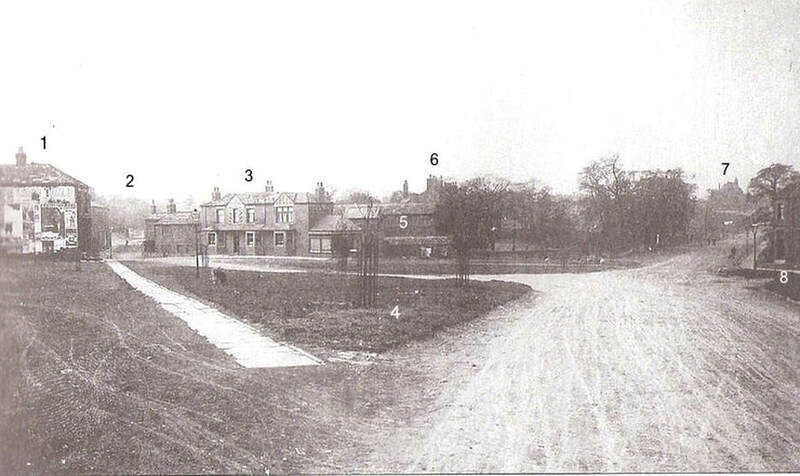 The first building on the right is part of Willow Garth Terrace then Webster Row fades away in the distance. 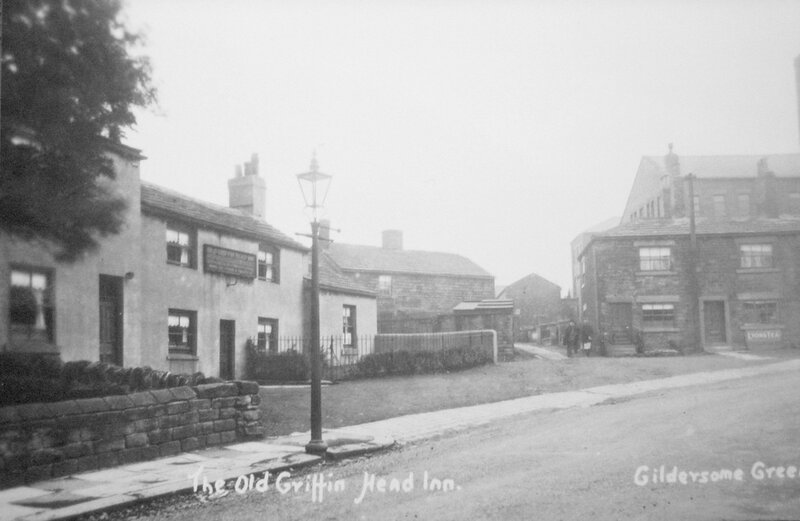 The roofline and chimneys to the left is The Griffin Head Inn. 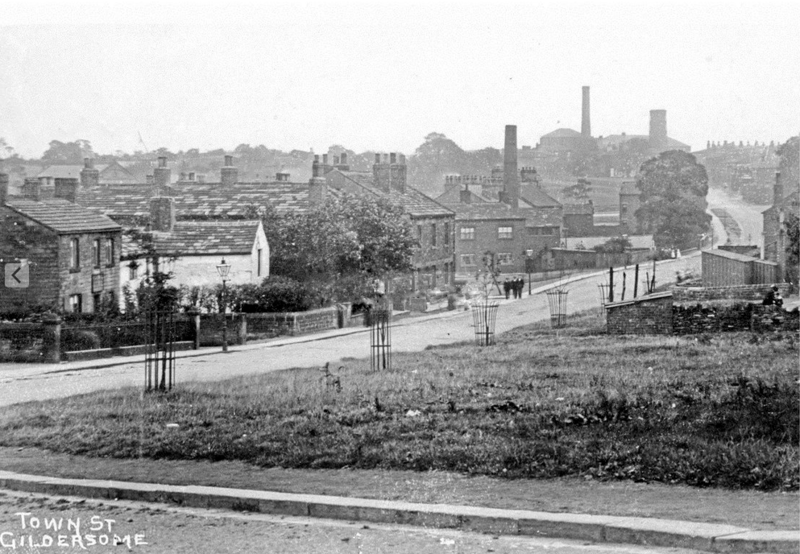 The tall chimney and cooling tower belongs to Highfield Mills on the far side of Beulah Terrace. Gap to Finkle Lane. The Old Co-Op is to right. The 3 saplings exist today as full grown trees. 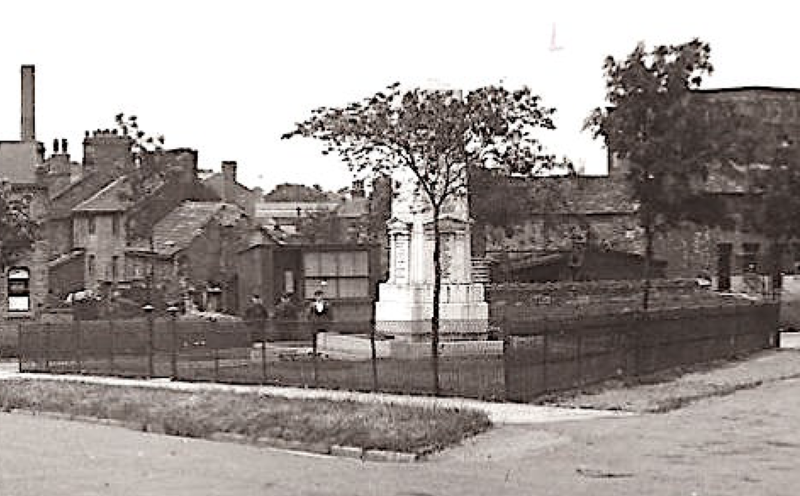 The War Memorial...behind is the Old Factory Yard and Maiden Mills on the right. Grove View and Gelderd House (right). It was built in the 18th century by the Sharp Family and was then known as Sharp's House. It acquired its present name when the Gelderd family purchased it around 1850. 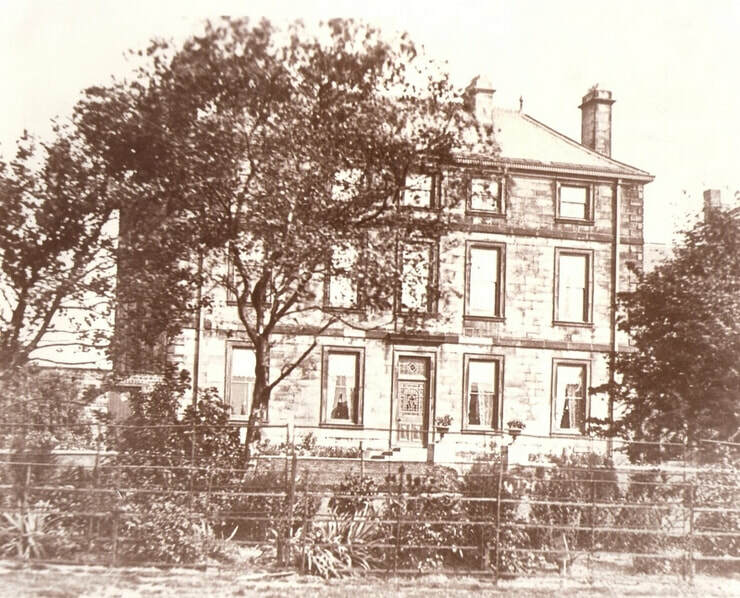 After that, the attached building, barley visible on the extreme right, became known as Sharp's House. 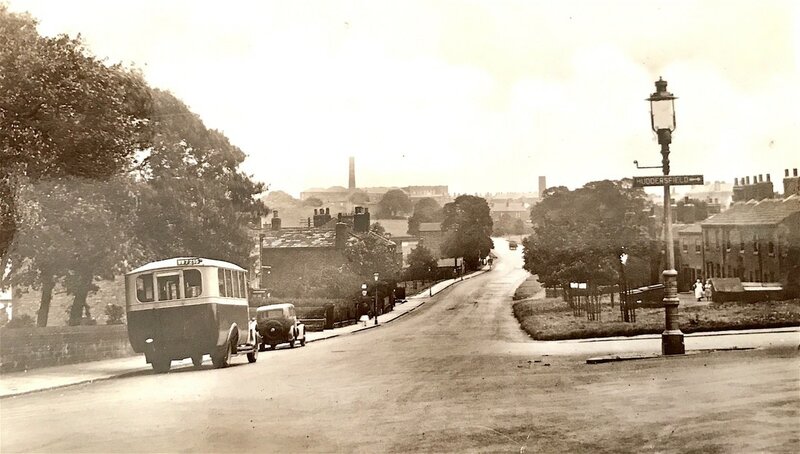 Town St and Mill Lane. Looking toward St Peter's Church. Street Lane bends off to the left and Church St. to the right. Nearly the same shot as the later photo below. Friend Cocker and family standing before Oak Dean. 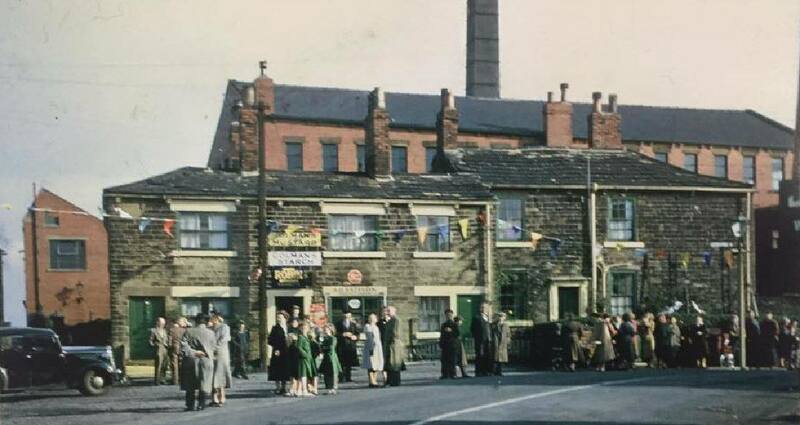 Midland Bank circa 1950s. 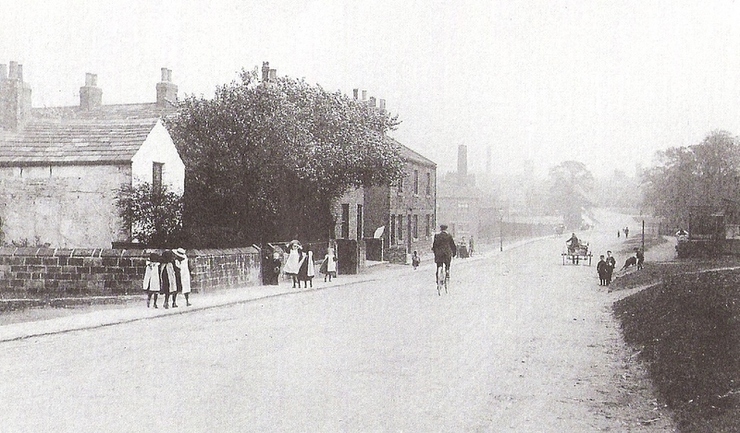 It was a shop and Post Office circa 1910. To the right, out of the shot is Rose Cottage. Behind are buildings belonging to Springfield Mills. 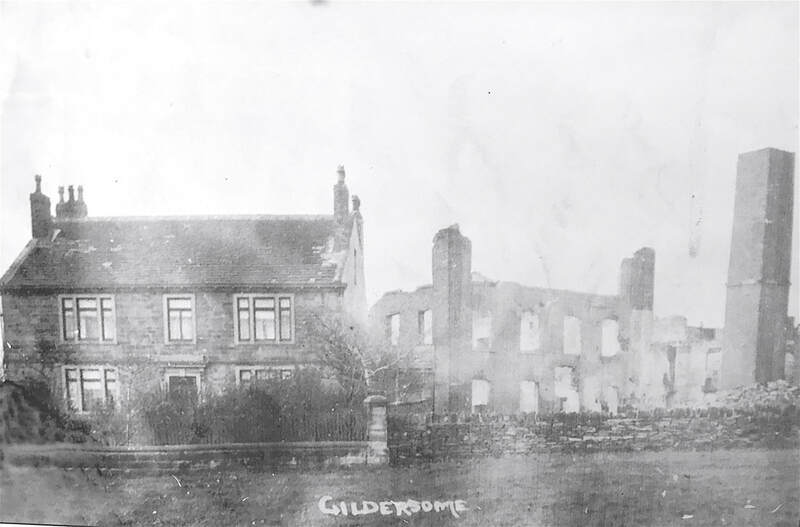 The Mills' property was once the site of the Gildersome's Liberal Club and before that Buttrey's Farm. 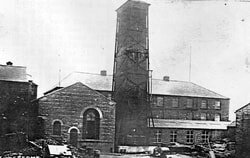 Springfield Mills circa 1940s. 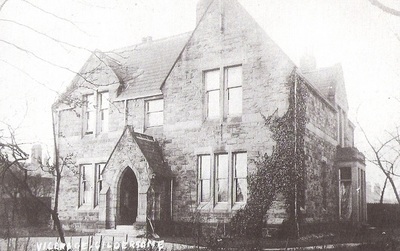 The land, called The Revil Ing, was purchased by William Morris of Springfield House in 1920, from the Gildersome Liberal Club. The camera's position is pulled back in this shot. Peggy Tub Row is on the right. School children on Town St. The camera's position is slightly advanced in this shot.